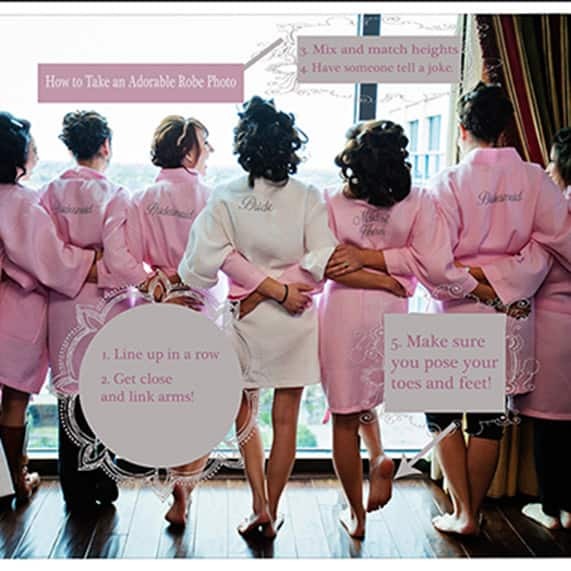 A cute getting ready photo with your bridesmaids is a must for your wedding album. While it may seem like a simple undertaking, I find that often times bridal parties forget about the little details (like posing your feet) to make sure the photo is mantle worthy! Follow these tips below to make sure it's one you'll want to keep and look at for years to come. 1) Line up in a row. 2) Mix and match heights so the photo looks candid. 3) Have everyone link arms or touch in some way so you all look connected. 4) Make sure to make dainty toes- the feet are so important! 5) Have someone tell a joke or have everyone look at each other and grin about how silly it is to be taking this super cute photo.